Ilan Kuzhambu or Thanni Kuzhambu is served in all functions and gatherings in chettinad region.It has the complete taste of sambar,Consistency of this kuzhambu is midst of sambar and rsasam. Since, Chettinad is a hot and semi-arid region climate was taken in to consideration for food preparation .This mild taste is preferred by all people in this region. Boil toor dal with turmeric powder. Boil cut vegetables in 3 cups of water. Heat pan and season with the mentioned ingredients. Add tomato saute well add salt along with it so that it oozes some moisture from tomato. 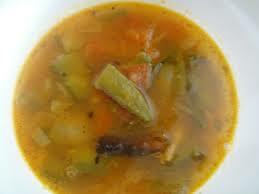 Add sambar powder saute well until raw smell changes,be careful while doing this saute in low flame to avoid burninig. Add boiled toor dal ,boiled vegetables along with its waterboiled and tamarind extract add one more cup of water allow it to boil for few minutes. Sprinkle some chopped coriander before serving.